When the curtain rose at The Savoy, we were instantly met with the diminutive and unmistakable Danny Devito quietly sitting on his chair. I do realise that the words quiet and Danny Devito are not quite synonymous but do not fear, the brash and incandescent actor does eventually shine through. From the opening few minutes, hushed whispers were heard around the auditorium from people remarking at how small he was and my instant (and internal) reaction was; please stifle your utterly dull truism. The remarkable thing however which is connected to his rather small appearance is that he has a truly towering presence which is felt even during his quiet moments although unsurprisingly, there isn’t too many of them. This production of Neil Simon’s 1972 play, The Sunshine Boys, is nothing short of comic gold. The in-demand Thea Sharrock directs an excellent cast, led by Devito and Richard Griffiths, two wildly contrasting characters, both physically and psychologically. Together they play a venerable and embittered Vaudeville double act that split up after Griffiths’’ character, Al Lewis, decided it was time to retire from show business. They were once great friends but they became quarrelsome during the end and for the final year of their partnership, did not utter a single word to one another. The play picks up 10 years since they last uttered a single word to each other and DeVito’s character, Willy Clark, is encouraged to reignite the old partnership for a television special by his agent and nephew. Al Lewis is keen but the obstinate and immensely proud Clark needs some convincing as he has become quite churlish as time has passed and holds a significant grudge against Lewis. 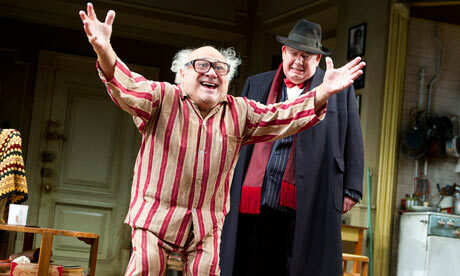 The true magic from this production occurs when DeVito and Griffiths occupy the stage. DeVito is loud, brash; unafraid to speak his mind while Griffiths, in stark contrast, is insouciant, sophisticated and charming. Their stark dichotomy causes moments of hilarity as they inevitably struggle to avoid bringing up the past. The play is beautifully written, full of long-running gags and it rarely relents in its humour, although it does have a few reflective moments that illustrate that even in the bitterest feuds amongst long-term companions and friends, there is always that comfort of simply enjoying being in one another’s company.